Local 188 on Congress St. opened as a combination cafe and art gallery in 1999. Since then, it’s moved across the street to become a restaurant and lounge which I’ve been to a handful of times and still has local art displayed. Usually I go for drinks, sometimes for food, but prior to the past weekend, I had never had a full dinner there. I thought it would be good to fully immerse myself in everything the Spanish and Mediterranean restaurant had to offer, so my wife and I met a visiting friend there for some food and times – I hoped they would both be good. We decided to eschew use of the Local 188 lot in favor of parking on the street since we had already parked nearby to go for a pre-dinner drink elsewhere. We got there just in time for our reservation and immediately started looking at what was available to eat and drink. There was a menu with a bunch of tapas items and one with all the other food. The drink menu had a hefty selection of all manner of adult beverages. I scanned everything quickly and then tried to pick a drink, but it was no easy task with the number of choices available. Finally settling on drink with a name I appreciated, I went with the Frost Delay – blueberry infused vodka, Maine apple cider, green chartreuse, lemon juice. Local 188 had a number of available infusions which sounded more interesting than the blueberry vodka, but I thought the drink was perfect for fall with the apple cider. My wife ordered the 188 Mai Tai – Goslings light rum, dark rum, amaro, pineapple juice, orange juice, grenadine. Our third rounded out the order with an Estrella European Lager from Spain. As a table, we discussed the plan of attack for our food ordering. We came to the conclusion that we would share a few of the tapas items and then order our own mains. It took us a while to decide what exactly we wanted because we were conversing about the topics of the day and Thanksgiving related minutiae. During the process, our drinks arrived. My frost delay came in a tall glass and was reddish in color. I took a sip. It was strong with no particular flavor standing out from the crowd. I didn’t find it super flavorful, but it was certainly acceptable and definitely appropriate as a seasonal cocktail. Our sipping and socializing continued, but we were able to free our yappers for a minute to make some decisions on food. For the sharing portion of our meal, we ordered Deviled Eggs, House Pickles, Meatballs, Flatbread w/ hummus, and Fried Garlic with caramelized tomato mayonnaise. It seemed like a lot, but we weren’t done yet. I went with Ricotta Gnocchi – rutabaga cream, plum vinaigrette, comte, speck – and she with the Butternut Squash Risotto – roasted butternut squash, herbs, grana padano. Our visitor ordered the Squash Salad – local squash, sage whipped ricotta, pepitas, apple miso vinaigrette. While eating bread and olive oil, we observed the open kitchen and great lounging area Local 188 provides for it’s patrons. There were couches and comfortable bar seating provided for those wanting a great place to relax and consume beverages. Of course, there were plenty of tables for those looking to chow down too. The art was the centerpiece of the decor. We soaked it all in and awaited a grand distribution of food at our table which we were told would come out as it was ready. The first item to arrive was a plate of three meatballs. They were saucy and covered with cheese like some of the women I’ve dated. I quickly reached for a ball, set it about my own plate, and spooned some of the sauce and cheese onto it. I quickly cut it into halves and consumed one. I immediately noticed that the sauce was top notch and full-flavored. Upon biting into the meat, I noted some clove. It was tasty, but I felt the texture was off – more hamburger than meatball. The excess of meat works for a burger, but for a meatball, it needed more filler to add extra seasoning and soften it some. While the taste of the meat was not bad, the sauce and cheese really made it. I think an adjustment on the ball itself would have made the total package better. Next up were the flatbread and deviled eggs. The flatbread was delivered with a scoop of honey chipotle hummus. I tried a slice with a liberal amount of the Mediterranean mush. I was thoroughly impressed with the level of spice in the hummus. The chipotle was right up front and definitely overpowered the honey, but it worked. Moving onto the eggs, I approached with a little trepidation. I’m more comfortable with the deviled eggs I know than those I don’t, but as a big fan of them, I was hopeful they would be on par with the great ones I’ve eaten. Sliding one into my mouth, I was impressed. It was different than any I’d had before with prominent mustard taste and crunchy crumbs on top. The mustard hit the perfect spot with me and I was enamored with the well-designed eggs. Pickles were plopped in front of us with a warning that they were spicy. They were comprised of beans, carrots, hot peppers, corn, pickle spears, and something else that evades me. I tried a sampling of them all. Holy moly very vinegar vegetables! The peppers were indeed quite hot. Other than that, they weren’t so much spicy as super strong. The vinegar on most of them was crazy potent even for myself as a regular eater of all manner of pickle. They were akin to a sour pickle for you who have ever eaten those. I felt that a lot of people would be turned off by their strength. I didn’t personally think they were bad, but it would have been good if there was a note on the menu about their intensity. Bringing to a conclusion our round of tapas was the fried garlic. There were five pieces on a plate, each sitting in a small puddle of the caramelized tomato mayo. I plopped one in my mouth and found it delectable. I really liked the mayo and combined with the fried garlic, it reminded me of aioli with a bit of a crunch. The garlic was good and left me wanting more. We all successfully worked to finish the tapas and took a deep breath in anticipation of the main courses. Shortly after the completion of our small plates, we received our primaries. 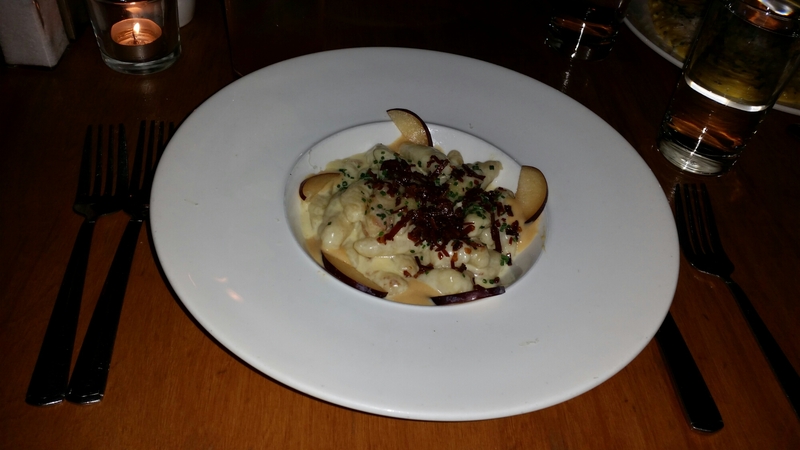 My gnocchi was drenched in creamy sauce, surrounded by thin apple slices, and topped with what I believe was crispy speck – a product of cured, smoked pork. I was anxious to try the dish and fired up the engine on my fork in order to dip it into the pile laying in my bowl. The somewhat cylindrical plump pasta fit perfectly into my gnocchi hole and took me on a rollercoaster ride of culinary sensation. The first part that stood out was the perfectly doughy texture followed by an extreme cheese blast which was a product of both the rutabega cream and comte. The final point of interest was the speck which provided a gnarly – in a good way – baconish taste. I was neutral on the apples, but the gnocchi was delicious and I’m not sure how it could have been made any better. My food was awesome and all three of us were pleased with the way the meal played out. I did have a small issue with a couple of the tapas items, but those were minor and I’d likely even order them again knowing what I do now. Other than those critiques, I found the food to be better than expected and – dare I say – excellent. The service was great too. With the exception of a macchiato, we passed on more of anything even though they had a dessert which included peanut butter – my fave. Our meal came to just under $150 after tip for all three of us which I thought was reasonable for what we ordered. I think Local 188 has crossed the line for me from pre-dinner lounger to full-dinner diner. Where do you stand on the matter? This entry was posted in Portland, ME food on December 3, 2015 by peterpeterportlandeater. That’s going a *bit* too far, even for you, my friend – and to be clear, we’ve never dated. Other than that thanks for the review!